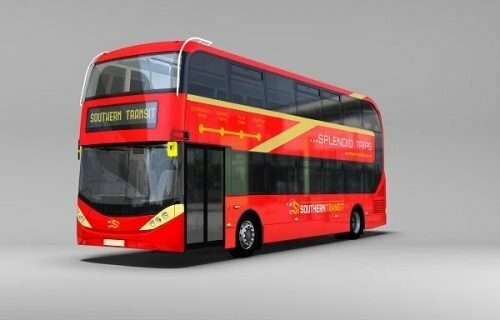 Southern Transit has purchased two new, custom-made Alexander Dennis Enviro400 City double-decker buses. Joining the fleet ahead of London’s Ultra-Low Emission Zone regulations, which come into force in April 2019, Southern Transit claims it is the only company to invest in the city-spec vehicles in the South East, making the buses the only ones in operation outside of London. The purchase of the Enviro400 City buses, which Southern Transit has re-named ‘Citymasters’ to reflect their bespoke build, cost £500,000. Neil Bird, Director of Southern Transit, commented: “Southern Transit may be a local independent business, but I wanted to ensure that we were prepared for the future, and could compete with the big players in the industry, hence taking the initiative to invest now. When the Ultra-Low Emission Zone regulations come into effect next year it is sure to affect a lot of people, not only industry professionals, but also group travel customers who must find a supplier that can meet the London requirements. Southern Transit’s Citymasters feature ‘a sophisticated temperature control system,’ tables and chairs with USB charging points, a wireless bell system, sky-view windows and LED lighting. Seating 72 passengers, the buses will be available for private hire from May 2018 at around £800 per day.